K2 Raider Apache snow skis usually come with M2 11.0 Ti bindings. This men's ski is one of the most popular products in the K2 company's line of skis. The K2 Raider Apache snow skis are considered all-mountain skis. They were designed for the advanced intermediate skier who wants to ski the entire mountain. The Apache Raiders are available in 156, 163, 170 and 177 centimeters. They are both versatile and forgiving. K2 suggests that these skis are perfect for a 50-50 mix of groomed and off-piste terrain. Its 78 millimeter waist makes it suitable for carving and functional in moguls and powder. The Marker M2 11.0 Ti binding enables powerful carving by diminishing the annoying chatter that often throws intermediate skiers off balance. The bindings have a DIN setting of 3 to 10, making them suitable for skiers who weigh between 65 and 240 pounds. The Apache Raider and the Marker M2 11.0 Ti are sold as an integrated binding system. This means that the bindings are already mounted, so you only need to ask the shop to adjust them to your boot length. Integrated binding systems usually provide greater flexibility and power transmission. 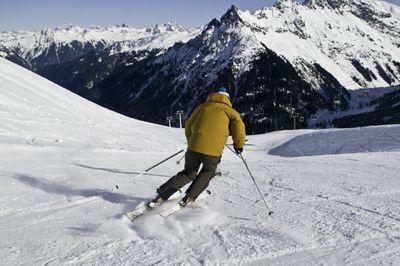 They also increase the size of what is known as the ski's "sweet spot" which is the point of the ski where the skier can exert maximum control. Integrated bindings also increase the distance between the boot and the ski, thereby enabling the skier to get a higher edge angle. The K2 raider Apache snow skis also have an economic benefit. Integrated systems are less expensive than separate purchases of the ski and binding. In 2010, for example, most shops were selling the K2 Raider and Marker M2 11.0 Ti for under $600. Most companies sell the ski by itself at the price. Bindings can cost an additional $200. If you consider that you don't have to pay what usually amounts to a $30 binding mount fee, the versatile K2 Apache Raider is an excellent choice for male skiers on a tight budget. The K2 Apache Raiders were designed with the cutting-edge, state-of-the-art technology that distinguishes the K2 ski company. K2 has been in business since 1961. The company is famous for its fiberglass skis. All of K2's men's, all-mountain skis have a wood core, which is composed aspen and fir. This accounts for their strength and durability. K2 developed the triaxial braiding technology in 1988. It is one of the most efficient ways to apply fiberglass to the ski's wooden core. The complex process involves sending the milled wood core through K2's patented Triaxial Braiding machine, which interlocks strands of fiberglass with the core. This method creates skis that have a great deal of the rigidity of fiberglass, as well as the flexibility of wood. MOD is the K2 company's integrated suspension system that provides a secondary core, which functions as a vibration dampener. It provides edge hold, power and maximum control in all types of snow conditions. The vibrations are minimized, but the ski maintains its overall flexibility and maneuverability. This is a unique feature. In most cases, skis with advanced vibration dampening capabilities tend to be stiff and difficult to turn. K2 uses a different type of MOD structure for its men's and women's specific skis. The K2 Apache Raider, for example, is thickest toward the center of the ski to dampen vibrations. The MOD tapers toward the tip and tail, thereby minimizing the ski's swing weight and facilitating smooth turn initiation. The MOD on the Apaches is designed in an "X" pattern, which enables superior edge control. The K2 Apache Raider snow skis are a viable choice for the advancing male skier who can only afford to purchase one pair of skis.